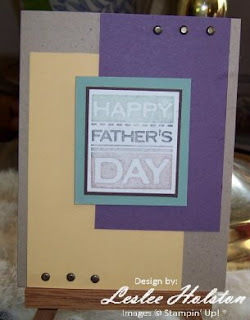 Leslee's Creative Inspiration: Happy Father's Day!!! Anyone who knows my wonderful husband knows that this is the perfect Father's Day card for him! These are the elements that surround him each day...with the exception of the smile on his face and the heart sign in his hand. I was going through my retired and much neglected stamp sets. You know, the ones we just can't get rid of because they hold some sort of deeper meaning to us. Well, this Little Trucks set is one of them. 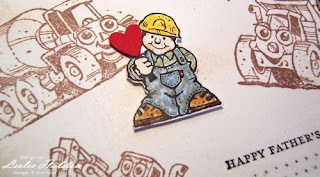 This was one of the first sets I purchased from Stampin' Up! many years ago. My boys were both small and they were thrilled that mama got a set with "beepbeeps", a "concreek" truck, and a dump truck! That's what daddy does! As the boys got older and it was no longer a "beepbeep" but an excavator, I used the set less and less. Well, daddy still does all this and I thought Father's Day was the perfect time to ink the set up again. Once again, I used the layout from this week's CAS challenge. It's such a quick and easy layout to use. And, as I said in a previous post, the possiblities are endless! The card base is Sahara Sand. I left the lined images stamped only in Close to Cocoa and not colored in. I inked the little man up in Jet Black StazOn and colored him in with markers. By coloring him, it allows him to be the focal point along with the sentiment also stamped in Jet Black. The sentiment is from a new catalog set called Teeny Tiny Wishes. (I can't wait to show you the new catalog!) I paper pierced two lines under the sentiment and distressed the edges of both layers (Whisper White & Basic Black) using my distressing tool on the cutter kit. I, also, added a bit of ink distressing to the Whisper White layer - just to make it look a little dirty. That's how daddy comes home most everyday! This next card was done using scraps of card stock I had sitting around on my desk. Whisper White, Basic Black, Sage Shadow, Perfect Plum, and So Saffron all layered onto a Kraft card base. The sentiment is found in All Holidays. I did the Poppin' Pastel technique to color the image. I simply inked my stamp up with VersaMark. Then I took the pastel color of choice on a sponge dauber and tapped it onto the image where I wanted it. Finally, I stamped it onto a scrap of white. It's a soft look to the image. I finished the card off with brass brads. 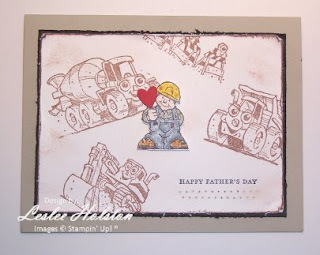 A great scrappy card with a very masculine feel. This card went to the other wonderful man in my life...my dad! Thanks for everything! I hope you and your family have a fabulous Father's Day! Enjoy the time spent together! Thanks for stopping in today. Come again soon.